All Streaming Church Video Live VOD Players come with built-in intelligent features, such as social/viral sharing features, re-embed options, color-customization, auto-start option, multi-bitrate enabled, with auto-bandwidth adaption through bandwidth detection and manual bitrate switching and more. Multi-bitrate enabled: Streaming Church Video Live VOD Players can play back multiple bitrate (video quality) files as one single video. Bandwidth detection: Streaming Church Video Live VOD Players measure each viewer’s available bandwidth (at the viewer’s computer and viewing location) within the first fragment of a second during the loading process and keep on measuring the change of the viewer’s available bandwidth throughout the video payback. Auto-bandwidth adaption: Streaming Church Video Live VOD Players then take that viewer bandwidth information and grab the most suitable file size from the Streaming Church Video Live video server network (from the data center closest to the viewer’s location). This happens all within the first fragment of a second, unnoticed by the viewer. The player then upgrades or downgrades the video quality throughout the video playback time automatically, whenever the viewer’s available bandwidth changes. All Streaming Church Video Live Players come with social sharing and email sharing features, allowing your viewers to start spreading the news about your great video content through social networks and by email. You can even allow viewers to re-embed your video content on their websites and social sites optionally, only if you want to give them that permission of course. Your VOD and LIVE Players have a slide-in on-player menu, featuring all your uploaded videos archived in the selected channel and all upcoming, scheduled live streaming events with title and description. This feature allows your viewers to access all your channel content, or read about all your scheduled, upcoming events, by triggering the on-player-menu. You can achieve the same result by using the embeddable "Media Center" instead, which is an embed object with a player and a separate video menu displayed to the right or bottom of the player. The video menus of your Media Center with integrated player are searchable with a text-search-field and display the channel's content with thumb nails, titles, description and upload date. Your videos will be delivered to a wide variety of mobile devices by using different streaming formats like h.264, webm, apple http and different player technologies like adobe flash and html5 video. Streaming Church Video Live provides mobile app development on request. Streaming Church Video Live creates and publishes your iTunes Audio Podcast. Send us your Logo or graphic artwork and we will make sure your Audio Podcast is branded correctly. Your Audio Podcast will be submitted to the iTunes network and, upon review and approval by Apple, published on the iTunes Audio Podcast platform, used by over 100 Million users. The CROSS.TV Roku Channel included in all Video Service Packages as well as in all Complete Packages, is a sub-channel in Streaming Church Video Live's Roku Channel Network. our VOD Channel will become in the CROSS.TV "Broadcast Channel"
All video content of the selected VOD Channel will then be "broadcasted" to Roku our Roku Channel within Streaming Church Video Live's Roku Channel Network. Your Channel will be featured within the Streaming Church Video Live Roku Network with all video content and new uploads of your selected VOD Channel. All new uploads will automatically appear as latest upload in our Roku Channel as well. Every uploaded video can be published to CROSS.TV - the biggest faith-based social media network in 20+ languages. Publishing your video to CROSS.TV will give you the opportunity to reach more viewers and to help spread your video content across the globe. 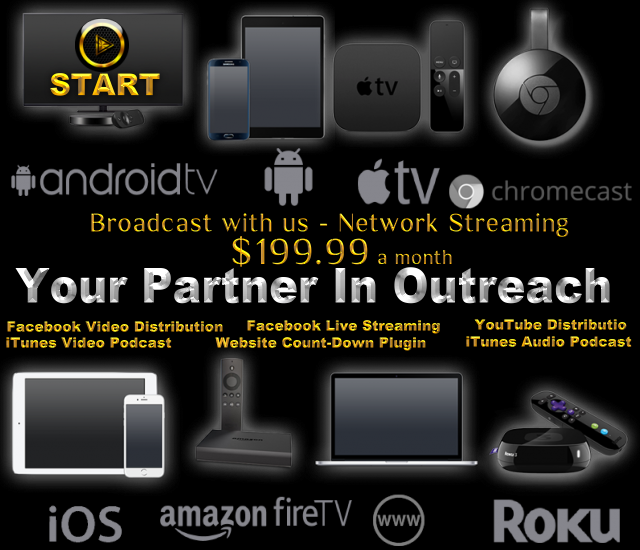 Publishing to CROSS.TV is included in every Streaming Church Video Live Streaming and Marketing package. To market Streaming Church Video Live’s video content and promote its "viral spread" we offer to distribute your video content to the most influential video sharing portals. Distribution to Facebook is included with larger packages. Because Streaming Church Video Live account is connected to our Facebook account, you can optionally choose to send any of your video uploads to our Facebook Page automatically. Simulated Live Streaming allows you to select a video from your uploaded VOD Media Archive and play it back as a live-event stream at a specific day and time. It works exactly like a regular live stream, just with one of your uploaded videos as the video source, instead of your local live-encoder (connected to audio and video sources such as microphones and cameras). Simply program a regular live event, assign it a date and time and select a video from your Media Archive. Connected TV Publishing is an application part of selected Streaming Church Video Live Service Packages enabling publishers to integrate on-demand, 24/7 and live-stream feeds into their Connected TV Apps of all types - including Roku Channels, Google TV Apps and Amazon Fire TV Apps. As a result, the transcoding and publishing of your media to your Connected TV Apps is included with selected Service Subscriptions. Facebook Live Streaming allows you to stream your live events simultaneously to your Facebook page in addition to all your publishing properties, such as your own websites, mobile apps, and Connected TV Channels. Facebook Live Streaming is included with larger packages. YouTube Live Streaming allows you to stream your live events simultaneously to your YouTube channel in addition to all your publishing properties, such as your own websites, mobile apps, and Connected TV Channels. YouTube Live Streaming is included with larger packages. The Scheduled Publishing feature gives you flexible control over the publishing timing of your on-demand media. Users are given the ability to control what date their media is published. The option to schedule a single publish date exists as well as the control to chose unique dates for each on-demand channel. Turn one of your VOD Channels into a continuous loop, simulating a 24/7 network. Just open up a Ticket in the Support Center letting us know the name of the VOD Channel you want to have turned into a looping continuous stream. Our developers will then build your continuous live-stream using the live-channels in your Streaming Church Video Live Account. The streams will be transcoded into different bitrates "on-the-fly" for bitrate-adaptive streaming. Want your live-streams recorded by our CDN and made available instantly as VOD - fully transcoded for all mobile devices, PCs, Smart TVs and set-top-boxes - entirely ad-free and bit-rate adaptive? Lightcast.com is taking live-stream-recording a step further! This feature allows you to have your live-streams recorded in one or multiple Live-Channels of your choice and send them into Streaming Church Video Live's Premium Transcoding right after the event to ensure maximum device compatibility. You don't want to build your VOD archive with non-transcoded flash files of live-streams as they will not be compatible for publishing to most of your publishing properties/broadcast outlets such as your mobile sites/apps and Connected TV apps. Chromecast/Google Cast is Google's digital media player which allows viewers to cast media from their internet device (such as mobile devices) to a TV Screen. Chromecast Publishing enables your LIVE, VOD, AUDIO content to be streamed to a TV Screen connected to Chromecast. This feature is integrated into the Streaming Church Video Live Players. Apple AirPlay Publishing allows wireless streaming between devices of audio, video, device screens and photos, together with related meta data. It works with computers using iTunes and iOS devices such as iPhones, iPods and iPads running iOS 4.2 or greater on selected receiver devices which include AirPort Express and AppleTV. The Streaming Church Video Live Count-Down Tool for website integration is custom-built by the Streaming Church Video Live Developer Team for your server environment and time-zone, and is integrated with our API of the Streaming Church Video Live Event Management System in our Control Center. For larger service subscriptions it's already included. 4K Streaming allows publishers to upload video content in 4K resolution and stream live in 4K resolution. Exceed the best HD television broadcast and achieve the most amazing TV and movie quality imaginable. Important to keep in mind regarding 4K on-demand uploads: in order to be able to display 4K content, a UHD screen is required on the consumer end. All other viewers will receive HD and SD of your 4K on-demand uploads. Your 4K on-demand file uploads will be transcoded into 4K, HD and SD versions to ensure that everyone is able to watch your content - not only viewers with UHD/4K capable screens.